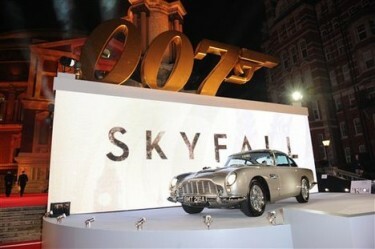 Skyfall 2012 – Success at the Box Office !! Skyfall has now been confirmed as the biggest ever seven-day gross for any film at the UK box office. It would seem as if the combination of great reviews and nostalgia for Bond’s 50th anniversary has created something of unstoppable force and it is hard tosee one of this week’s new releases toppling 007 from the top of the chart. 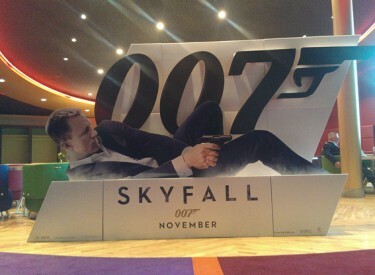 Skyfall opens in the US next Friday 9 November 2012. EON Productions, Metro-Goldwyn-Mayer Studios and Sony Pictures Entertainment are delighted to announce that SKYFALL has taken an extraordinary £37.2 million in its opening week, overtaking Harry Potter and the Deathly Hallows: Part 2 to secure the biggest 7 day gross of all time in UK box office history. SKYFALL, the 23rd James Bond adventure, continuing the longest running and most successful franchise in film history opened in 587 cinemas across the UK and Ireland on Friday 26th October. It will release in the US on November 9th. “The continued record-breaking success of this film is a true testament to all involved and the global power of this 50 year old franchise” said Gary Barber, Chairman and Chief Executive Officer, MGM. Thank you, Bond fans everywhere, for making SKYFALL such an unprecedented success. As Skyfall opens in the biggest release ever for a James Bond film plans are already well advanced for the next 007 thriller again with Daniel Craig in the role – not unexpectedly. There is also speculation in the press this very day that Sam Mendes will again be the Director – at least Daniel Craig wants him to be apparently. 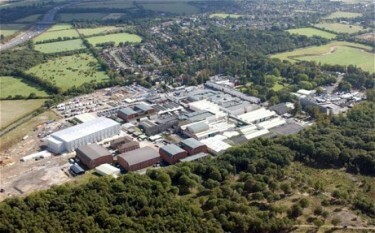 There was a four-year wait between Quantum Of Solace and Skyfall but Bond 24 is already in pre-production and the plan is for it to start shooting at Pinewood Studios around this time next year and be ready for cinemas in the autumn of 2014. 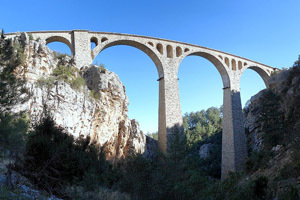 The Bridge - where Bond falls from – ‘Take the Bloody Shot’ says M is actually the Varda Bridge, Kiralan, in Turkey. 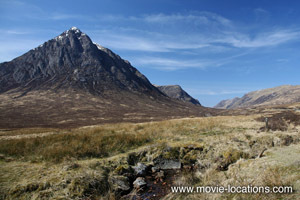 On to the Scottish Highlands – above. I must have seen this first about a 1954 or 55 when each Tuesday we had someone come to out local village and put on a proper film show with a typical second film about 60 mins or so, then the trailers and then the big picture – as we used to call it. 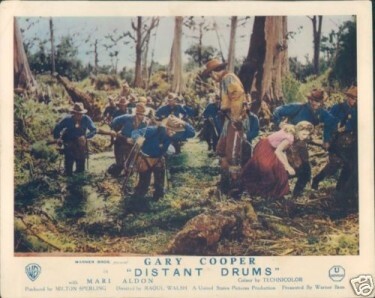 We had a village hall in this small rural village in England and it was here that among many others we saw Distant Drums – and what a thrilling film it was and is. That was the first time that I knew that such a sub tropical part of the USA existed and I learned about the Everglades in Florida of course. We all know of it nowadays but in the mid fifties not very many people had ever been there. It was only 10 years after the end of the war – and during that time many men had travelled widely but sadly that was because of conflict but other than that most people had not. 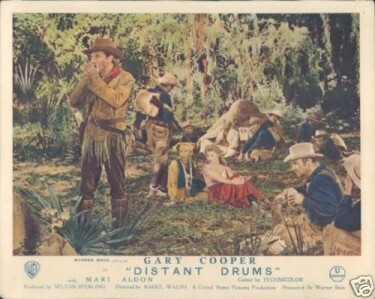 This was an unusual western – first because of its setting in Florida and also because we saw alligators and snakes – here again that was the Everglades and probably still is. The underwater fight to the finish at the end of the film was shot at Silver Springs in Florida which is still very much on the go and used in movies. Prior to this film Tarzan Finds a Son used Silver Springs with Johnny Weissmuller and Johnny Sheffield. In this film we are taken to the swamps, jungle and the Indians in a stone fort because this is a Florida Western! The story opens with US Navy Lieutenant Richard Tufts arriving in Florida with a small boat which he has taken overland to Lake Okeechobee. He travels separately and meets up with Capt. Quincy Wyatt, who will lead the mission against an old Spanish fort on the opposite side of the lake which is being used by the Seminole Indians. The real story is about how Quincy Wyatt (Gary Coper) and his men along with some rescued prisoners from the fort, escape through the alligator infested Everglade swamps with the Seminole chasing after them. Not all of them will make it – some will die at the hands of the Seminole Indians and others to the alligators! The above shot is a favourite of mine. 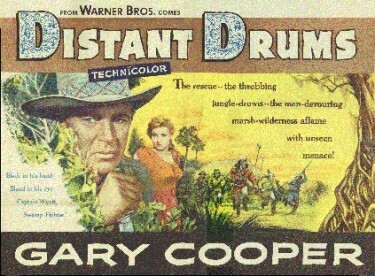 It really sums up the film – Florida Everglades, Gary Cooper and Mari Aldon. The Florida setting certainly gave this film a different feel to just about every other western. The alligators here ARE more frightening than the usual rattlesnake and there was one quite bloody sequence shown when one of the men was killed by an alligator. They all pause for breath – above – in the Everglades. 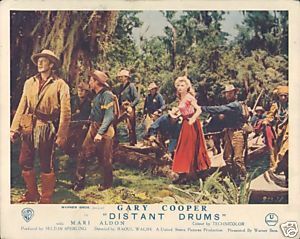 It is an action-packed film and I love the Technicolor here which gives the Everglades a realistic beauty. The scenes where they are on the canoe on the water paddling through the trees is a beautiful shot. 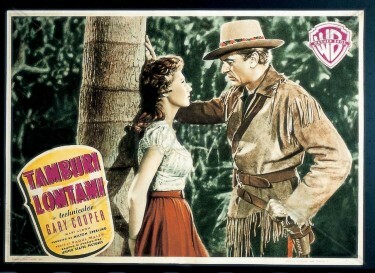 Gary Cooper is good as always but nowhere near as good as he was in ‘High Noon’ . I reckon he would have enjoyed working down in Florida though. Mari Alden takes the female lead but there isn’t a lot in this part for her to do much with. We do learn that she isn’t quite the Southern lady she makes out to be but that hardly seems to affect her character and this revelation is quite sketchy anyway. Mari Aldon was originally a ballet dancer born in Lithuania. She later married film Director Tay Garnett although he was more than 25 years older than her and he died in 1977 although they were by then divorced. I don’t know much about her but here are some interesting quotes written at the time. 25 October 1955 Her daughter, Tiela, is born in Los Angeles. 31 October 2004 Mari Aldon Garnett she died at age 78 in Las Vegas. She is survived by her daughter, Tiela Garnett; grandson, Taylor Benatsou- granddaughter, Chloe Fazio; and sister Janet Kozlowski. It seems that she could have been a bigger star but she had a family and continued her career in films and later TV so she maybe had a good time. I hope she did. Bérénice Marlohee is the leading female in the film along with Naomie Harris. Bérénice was born in Paris in 1979 of mixed ancestry she was the daughter of a French mother and a Cambodian / Chinese father. Her mother is a teacher and her father a doctor. She originally wanted to be a a pianist. Initially she struggled to get screen roles in France because people did not think she fitted the mould of a French actress. 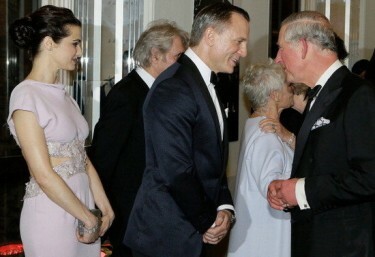 Before her lucky break came with the Bond film Skyfall, she mainly appeared on TV. This does seem to beg the question – How on earth did they pick her out for this major role ? But maybe the next paragraph explains …. She is a strong believer in fate. During an interview, she claimed to have dreamt of acting alongside Javier Bardem at least six months before the Bond audition. After the dream, she had a feeling that all would work out well – and it did. It was only after the second audition for Skyfall that someone actually mentioned to her that Javier might also be cast. Naomie was born and brought up in London and is the daughter of writer Lisselle Kayla, a single mother who came to the UK as a child. After graduating in 1998 from Cambridge with a degree in she trained at the Bristol Old Vic School. Among many roles she has played is that of Elizabeth Lavenza in Danny Boyle’s production of Mary Shelley’s Frankenstein in the Theatre. In fact she is probably best known to American audiences for her role as Tia Dalma in Pirates of the Caribbean: Dead Man’s Chest (2006) and Pirates of the Caribbean: At World’s End (2007). Some moths ago it was first reported that Harris was in talks for a role in the upcoming 23rd Bond film -Skyfall – as field agent Eve and this turned out to be correct. She is very good in this role and she appears regularly throughout the film – and I have an idea she may continue in future ones. It is certainly an action-packed role she has as you will see the in clip on the Trailer below when she is taking aim at the villain who is fighting with Bond on the top of a moving train – and ‘M’ screams the order ‘Take the Bloody Shot’ – it is a great sequence. Skyfall not a film of the fifties of course but James Bond is very much a creation of that decade when he first appeared in print so I can include this film and characters on this Blog I feel. 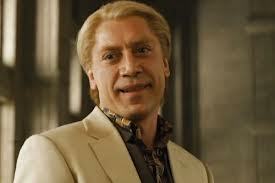 Javier Bardem – well what does one say about probably the best Bond villain ever. 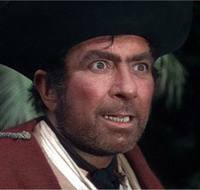 I have written before in an earlier post that I thought that Javier Bardem’s part was played by him almost in the same style as Robert Newton’s famous portrayal years ago of Long John Silver in Treasure Island. Javier dominates the screen and is ‘larger than life’ in the scenes he has and in a way it is a calculated – slightly over the top performance with the tiniest hint of pantomime – that enables him to become a real scene stealer. I reckon the Director gave him carte blanche to ‘let rip’ when he was on screen – and this he did to great effect. This strategy though means that once started it would be very difficult to ‘rein him in’ . It didn’t much matter in either of the performances I mention because the actors just knew what they were doing. Byron Haskin did the same with Robert Newton in a now classic film role by which all future actors in the part would be compared – this might happen again with Javier in this film – and the villain in future Bond films just might have to up his game after this. A low key performance would now be difficult to take because this is, indeed, a hard act to follow !! 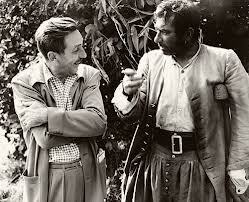 Robert Newton and Walt Disney discuss the film at Denham Film Studios – They both looked very young in those days – and we saw in this film (Treasure Island) Robert Newton pull off a marvellous portrayal – to become THE yardstick from which all future pirate performances would be judged. Has anyone out there been struck by the similarity of these two performances or is it just me ?